Great music! Wonderful musicians, great volunteers and a great cause. Proceeds from the Susanna’s Kitchen concerts go to help people in our community who are in need, through Barnabas Connection and Operation Good Shepherd, plus day care scholarships for pre-schoolers at Mother’s Day Out. Great food! Pie, tamales, pizza, coffee, soft drinks available. Doors open by 7:00 pm. 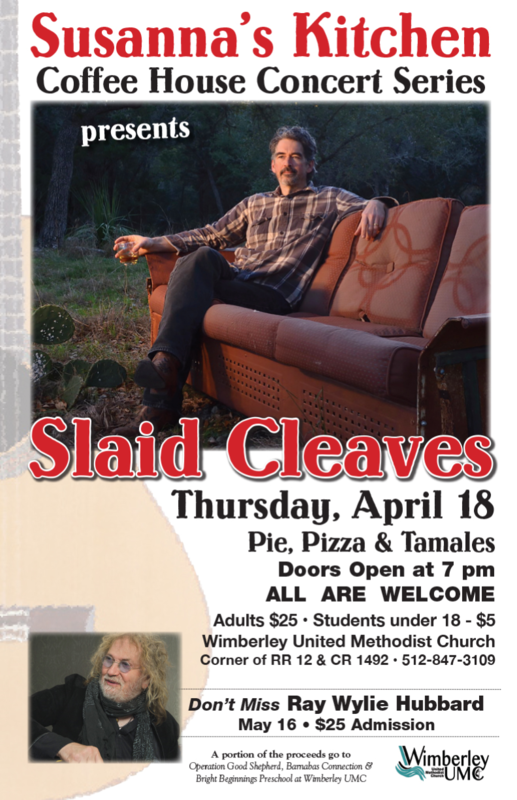 Concerts start at 7:30 pm and are held in the Fellowship Hall, Wimberley United Methodist Church (corner RR 12 & CR 1492). Great Cause! We all benefit- those who come to hear the best music in Wimberley, those who have a great time volunteering their talents to produce the concerts, and the people who are helped by our donations. Mark your calendars for every Third Thursday** year round. Tickets are sold at the door and range in price from $15 to $25, depending on the performer. Students (under 18) are $5. Contact us susannaskitchen@gmail.com.